The Apple Watch has made its official debut at Apple Stores across Australia, with the vendor taking pre-orders exclusively through its online portal beginning today. And even though Apple commences its Watch delivery on April 24, many local businesses are already on board to have their apps on the platform. CommBank, Woolworths, and Oz Lotteries are just some of the first few to deliver apps for the smartwatch. But we predict they won’t be the only ones that get on board the Apple Watch bandwagon. CommBank has announced its CommBank app for smartwatches, that has an Android version currently in pilot for customers and an Apple Watch version on the way. CommBank said the app is a natural extension of its mobile app and will offer everyday mobile banking essentials such as Simple Balance with a tap of the watch, an ATM locator, and transactional capabilities with Cardless Cash. “Smart watches represent the next exciting generation of personal mobile devices. We are at the start of a new way of banking and together with our customers’ passion for mobile and cardless banking, we will lead in developing ways to fully leverage the capabilities of smartwatches,” CommBank digital channels executive general manager, Lisa Frazier, said. As for Woolworths, it is all set to be one of the first apps available for Apple Watch when it launches in Australia on April 24. The company aims to enable its customers with easy access to their shopping needs and any other Wollies information. Shopping lists created on the Woolies Shop mobile app will be able to be accessed via the Apple Watch app and its Glance function will provide customers with the nearest store location, walking and driving distance, and opening hours. 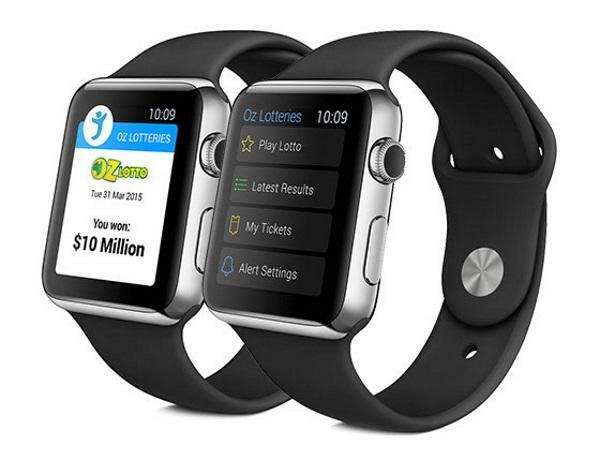 Oz Lotteries will also be available for the Apple Watch soon. To be released at the end of April, this app is said to be the world’s first lottery app for the Apple Watch. Some of its functionalities include upcoming jackpot alerts, displaying winning lotto numbers as well as alerts for personal ticket results. The Apple Watch will be connected to the iPhone Oz Lotteries app, allowing users to also purchase tickets online.